Ready for an all new interactive and colorful activity for the kids? Make your world more colorful with Give Fun's all new Coloring Balloons that can self-inflate with normal air! Why you should get these balloons? 1. Great for Party Favours/Gifts: the size is just nice for the kids to bring home after the party. You may come out with a Coloring Balloon Station at your kids party for the little guests to engage them in coloring activities and balloon fun! 2. Auto Air-Inflated: kiss goodbye to the hassle of blowing up the balloons manually! Wow your kids by seeing how the balloons inflate on its own. Balloon can stay inflated for a few weeks. 3. Highly Durable & Tamper-Free: balloon is tested to be able to withstand weight of a car, just how durable it is! The best part is the balloon will not burst! 4. Safe and Non-Toxic: contents inside the balloons are made of non-toxic substances, not harmful to the children in case where the balloons are torn intentionally. Every Coloring Balloon features two different designs (on the front & back), select your favorite prints or just get them all! Suitable for both adult and kids, recommended for kids age 3 and above (pre-schoolers, kindergarten and etc). Product comes with a standard white balloon stick (to be used to snap it to the balloon), does not include color pencils/paints. 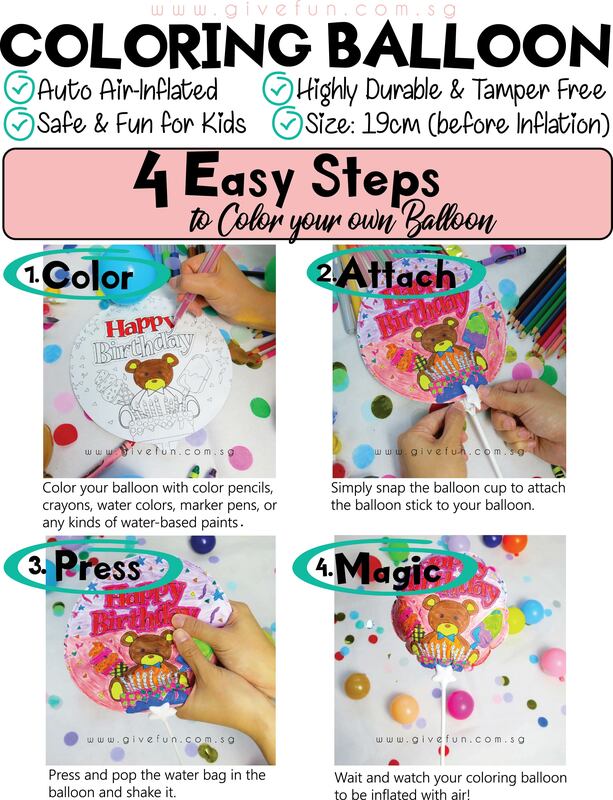 COLOR: Color the balloon with color pencils, crayons, water colors, markers, or any types of water-based paint. ATTACH: Simply snap the balloon cup to attach the balloon stick to your balloon. PRESS: Press and pop and substance in the balloon and gently shake it. MAGIC: Wait and watch your coloring balloonto be inflated with air, automatically!